So far we have arrived at Homerton Day Unit for 7:30, the reception staff were running late so the nurses got us all set up. There are about 7 other couples here all for the same procedure. We got taken through to a cubicle and given a backless gown and some disposable paper knickers. Also a hair net. Three different people, the nurse, the anaesthetist and the surgeon have seen us, as well as another doctor just to be on the safe side. They all ask when I last ate, when I last drunk water, my date of birth and if I’m allergic to anything. We are then all moved into a television room which is just for women. OH has to go off now and will be called when I’m out. The anaesthetist said they won’t put me fully under unless they have to, I’ll just be sedated for easier access. I will have to have a cannula in my hand, which will probably be the most painful part of all of this. In the waiting area no one is talking. We are all trying to be cool but I’m not sure how cool we are! We are getting called up one by one. The TV has a Bank Holiday Family Film. I’m feeling OK. The staff at Homerton know what they are doing and that is good enough for me. I was very nearly sick in my brother’s car. I feel very tired and queasy. So when you go in they get you on a bed and take blood pressure etc. The anaesthetist and nurse were absolutely lovely, I was actually laughing! 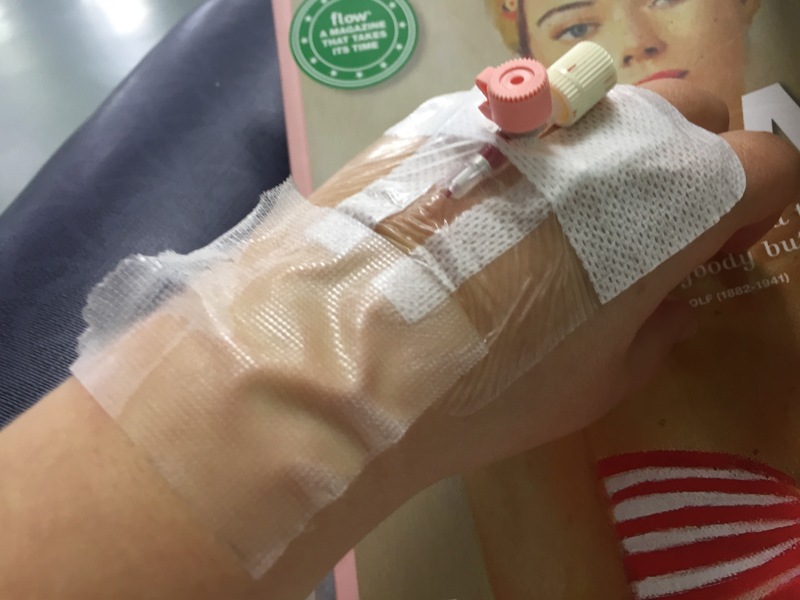 The cannula was the most painful bit. I don’t remember anything after the anaesthetic until being woken by a different nurse. I would have been quite happy sleeping for longer! Sitting in a comfy chair you get a sandwich and cup of tea and water until you can successfully have a wee. I then went into a TV room with Alex and the other couples who were done. This is when I started to feel a bit more queasy. One at a time the main nurse took us through to tell us how it all went. They collected 9 eggs! Not bad at all. They are a bit small but they didn’t seem to worried. They are going to let us know after 5 days if we will do a fresh or frozen transfer, it all depends on how good the embros are. We had an explanation about what happens next and how to do the rectal antibiotics (!) and we were on our way. We got a phone call on the way home when I was sitting in my brother’s car with a sick bowl. The sperm quality is better than they thought so instead of ICSI they are going to do IVF. So it won’t be injected into my eggs but left in a Petri dish to get together. So now the only things left are for the eggs to be fertilised, then turn into embryos, then successfully implanted, then to take past 2 weeks, then to go full term pregnancy, then to get through labour. We can do this! Come on little eggies!